Uncertainty is present in every managerial decision, and Managerial Economics: A Mathematical Approach effectively demonstrates the application of higher-level statistical tools to inform and clarify the logic of problem solving in a managerial environment. 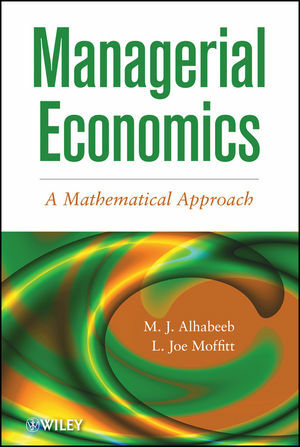 Managerial Economics is an excellent book for upper-undergraduate and graduate-level courses in business and economics departments. The book is also an ideal reference and resource for managers, decision makers, market analysts, and researchers who require information about the theoretical and quantitative aspects of the topic. M. J. ALHABEEB, PhD, is Professor of Economics and Finance in the Department of Resource Economics at the University of Massachusetts, Amherst. Dr. Alhabeeb has been teaching finance and economics for over thirty years and is a recipient of the Academy of Educational Leadership’s Outstanding Teaching Award for Innovative and Creative Teaching. L. JOE MOFFITT, PhD, is Professor in the Department of Resource Economics at the University of Massachusetts, Amherst. The author of over fifty journal articles, Dr. Moffitt received his PhD.